Home » Joffa: Isn’t That Life? Title: Joffa: Isn’t That Life? Availability: Selected bookstores, the Epilepsy Foundation, Busybird Publishing, and online. People have a misconception that Joffa is nothing more than a Collingwood bogan, a loudmouth in the Collingwood Cheer Squad. But there’s more to the man than the image popularly espoused through the media and by people whose only interest is to cut him down. Did you know Joffa came from an abusive household, that he was homeless as a teen, and about the countless hours of volunteer work he does for causes such as epilepsy, homelessness, and mental health? Did you know that football saved his life? In all likelihood, all you’ve ever really known about him is he follows Collingwood, but do you know about any of the machinations that go on behind the scenes as a supporter in the mighty Collingwood empire? Joffa: Isn’t That Life? is a story about Joffa’s life in his own words. 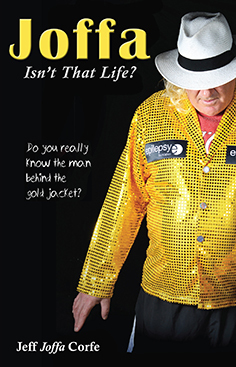 Whether you admire the man or loathe him, the only way you’ll ever get to know him – and get to know the true story about what makes Joffa tick – is through Joffa: Isn’t That Life? Now with BONUS material – Joffa’s top ten players, with profiles written by authors Joffa has personally hand-selected! A portion of proceeds from the sale of every book goes to the Epilepsy Foundation.